Colored etching. Printed by The Collectors Press Lithography Workshop, San Francisco. Lithograph. Printed by The Collectors Press Lithography Workshop, San Francisco. The early 1960s marked a significant turning point in American printmaking: the rise of communal studios provided new avenues for creative and technical exchanges between artists. 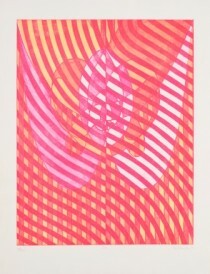 Since the early 1940s, when Stanley William Hayter transplanted his Atelier 17 from Paris to New York, American artists were becoming familiar with a wide range of printmaking techniques. By the latter twentieth century, printmakers such as Tatyana Grossman, founder of ULAE (Universal Limited Art Editions), and June Wayne, who founded the Tamarind Workshop in Los Angeles, greatly enlarged and successfully marketed the printmaking enterprise. These new-style printmakers began to take on some of the responsibilities of publishers and dealers, helping to streamline the production and distribution of artists’ prints. Artists formerly rooted in the solitary studio practices of Abstract Expressionist painting began to collaborate regularly with master printmakers (some, like Robert Motherwell, even going as far as to establish their own workshops). In California, the emergence of collaborative presses helped to rescue lithography from virtual extinction—which in turn made abstract prints readily available to American collectors. 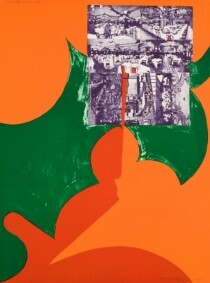 The works in American Abstraction: The Print Revival of the 1960s and '70s, most of which are drawn from the splendid gift of Judith and Stephen Wertheimer to the Bruce Museum, include prints produced by Ernest de Soto of The Collectors Press Lithography Workshop and Irwin Hollander of Hollander’s Workshop. 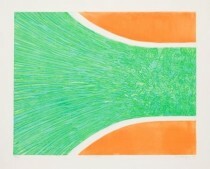 From vibrant biomorphic forms and primitive marks to lively calligraphic gestures and bold color-field patterning, the works in American Abstraction suggest the evolution of abstract art in printmaking during two exciting decades of the post-war moment. This exhibition was curated by Elizabeth Smith, 2017-18 Zvi Grunberg Resident Fellow, and underwritten by the Connecticut Office of the Arts and The Charles M. and Deborah G. Royce Exhibition Fund.